Yesterday AMD announced a cheeky new promotion. In brief, it is seeking to hijack a bit of Intel's 40 years of the x86 processor celebrations to promote its top end Threadripper processor. Though a little late for maximum impact, AMD says it will offer Intel 8th Gen Core i7-8086k Limited Edition Sweepstakes winners the chance to swap over to a flagship 16-core AMD Ryzen Threadripper 1950X processor. Before we go any further, the AMD promotion only applies in the US, and only to the first 40 respondents. 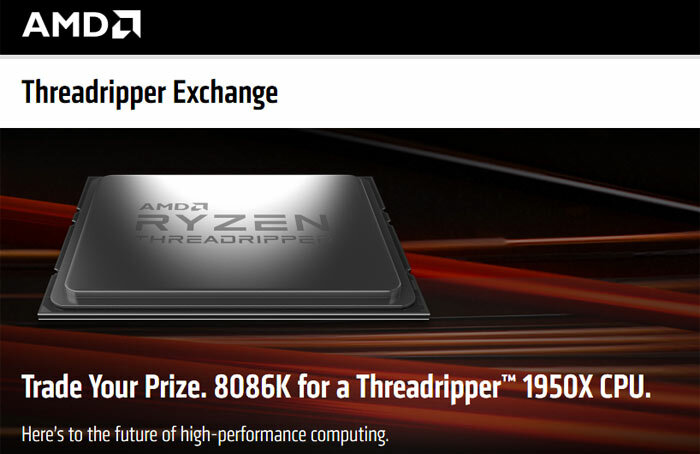 On its counter-promotion page AMD explains "Our competitor recently kicked off a sweepstakes to celebrate the first 40 years of the x86 processor by giving away 8,086 limited edition processors." AMD goes on, to tease "We appreciate the advancements they've helped drive with the x86 architecture over the last four decades. But, we’re ready to take it from here. That's why we're giving 40 performance-hungry enthusiasts in the U.S. an opportunity to celebrate the next 40 years of high-performance computing by trading in their commemorative processor prize for our CPU that enables you to work, play and create with heavy metal." If you want a refresher on how the 16-core AMD Ryzen Threadripper 1950X processor performs, please head on over to the linked HEXUS review, from back in August last year, to check through our extensive tests. Only last week the 40th Anniversary 6C/12T Intel Core i7-8086K (14nm) was in HEXUS labs, and you can read through that 9-page review by clicking above. The steps you need to complete to swap your (unopened, boxed) Intel Anniversary processor for the AMD Ryzen Threadripper 1950X will be revealed on this webpage from 1pm EDT on 25th June. A few hours ago, Intel responded to the new Threadripper 1950X counter-promotion. Its witty Twitter reply to AMD was to say to AMD: "if you wanted an Intel Core i7-8086K processor too, you could have just asked us. :) Thanks for helping us celebrate the 8086!" See below. Haha yeah good one AMD, might be worth a thought if you are going to actually use the CPU, but as it is limited edition etc. I am pretty sure if you didn't use it and kept it boxed, it will be worth more to a collector in the future. If I had won one I wouldn't be opening it put it that way.